Citation Information: J Clin Invest. 2010;120(7):2331-2344. https://doi.org/10.1172/JCI42601. 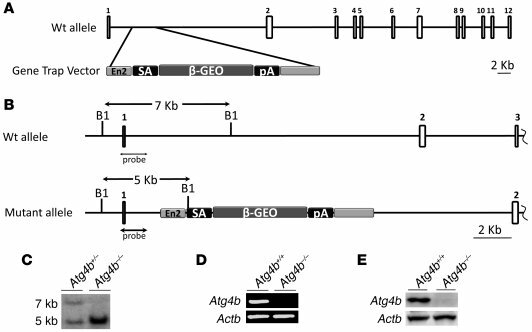 Generation and genetic characterization of Atg4b-deficient mice. (A) Top: Schematic representation of the WT Atg4b locus, in which the coding exons are depicted as numbered boxes. Bottom: Gene trap vector structure containing a splicing acceptor (SA), a bacterial β-galactosidase fused to the neomycin resistance gene (β-geo), and a polyadenylation signal (pA). (B) Schematic representation of the WT and mutant loci showing the new BamHI (B1) restriction polymorphism generated by the insertion of the gene trap vector. The DNA probe used for the detection of the mutant allele is shown. (C) Southern blot analysis of genomic DNA from Atg4b+/– and Atg4b–/– mice. (D) RT-PCR of RNA of liver tissue from WT and Atg4b–/– mice showing the absence of full-length Atg4b mRNA expression in mutant mice (n = 6 mice per genotype). (E) Immunoblotting of liver protein extracts from WT and Atg4b-knockout mice confirming the absence of Atg4b protein in mutant mice. β-Actin was used as a loading control.